If you want to get the ideal physique within the shortest time possible, you have to read fitness quotes. Working out is not easy, and it can sometimes take a toll on your body. You may feel like you want to give up because you are not used to such pain. But what happens when you do so? You remain where you were without any progress. You need fitness quotes to motivate yourself and make you realize that what you are doing is worth it. As you work out, you have to be ready to push yourself beyond your comfort zone. It is only by doing this that you’ll be able to reach new heights with your training. If you want to get better-looking abs, be ready to do hundreds of sit-ups per day. If today, you did 100, tomorrow you can do 150 and keep increasing. If you take the literal meaning of this quote, you will realize that it’s actually true. Most people will run until a certain point because they prefer a short distance. If you decide to run further than everybody else, you’ll realize that there are very few of you. In fact, the path may be very clear. The same goes for your workout routine, if you want to stand out from the rest, go beyond with your routine. There’s no such thing as a bad workout. As long as you’re doing something to get in shape, you’ll eventually get there. Sure you might make a few mistakes as you are starting out, but that shouldn’t discourage you. You only regret if you don’t do anything. Stop procrastinating about whether or not you should try that new diet or start a regular exercise routine. When you do that, you’ll never do it since your body is hard wired to attempt to avoid things that tend to be laborious. (1) Take a leap of faith and act now because time doesn’t wait for you to be ready. Failure is part of the success journey. Therefore, don’t be afraid to work out because you cannot lift certain weights or do more than 50 press-ups. You may fail at first, but the more you do it, the better you become. So play the game! This is especially true if you’re working out to compete in a body building contest. You have to constantly work on your core muscles if you want to stand a chance at winning. If you’ve done what is required, you are likely to win since you already did most of the work during practice. You have to want to work out if you want to succeed. Therefore, make exercising a priority and do your best to achieve your fitness goals. There should be no room for excuses. This quote is related to the previous one. Always remind yourself that the reason you began working out is because that’s the thing you want the most in your life. Furthermore, reaching your ultimate goal will give you happiness. So your trainer tells you that it may take roughly three to six months for you to notice the changes from your workout. You might be thinking that this is such a long time, and you aren’t ready to wait. However, if it’s really what you want, go for it. Time will pass by so fast that you won’t notice. You have to remember that your limitations are only self-imposed. Your body can handle most of the strenuous exercises that are required to make you fit. It’s up to you to discipline your mind. 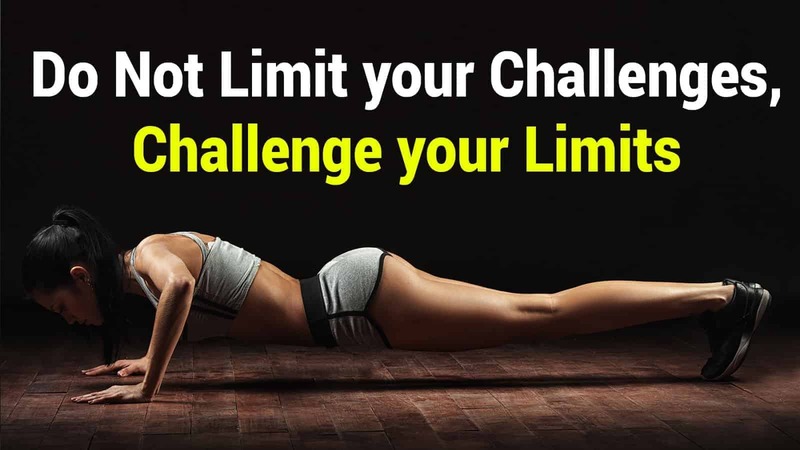 You have to remove any sort of limitations from your thoughts if you want to meet your workout goals. Don’t expect to get what you want without breaking a sweat. Learn to have self control over your thoughts and do what is required. (2) Read this fitness quote whenever you feel too lazy to hit the gym. It’s bound to get you on your feet and focused on your goals. This is one of those fitness quotes that helps you stay disciplined and focus on the healthy diet needed for a successful workout routine. You can write this quote somewhere and stick it in the kitchen area. That way, you’ll always be cautious of anything you eat. Take a look at this quote every time you get up from bed. It will help you remember why you started working out in the first place. This quote reminds you to keep going every day and make exercising a habit. You might not be the buffest guy around or the fittest girl at work, but you can attain the perfect physique if you commit to a workout routine. Remind yourself that you have to start from somewhere to get to where you want. The choice is yours. Read this quote whenever you feel as if the workout isn’t helping you get to where you want. This quote reminds you of how far you’ve come to get to where you are. Therefore, it would be a waste to give up when you’re almost close to achieving your fitness goals. This is another fitness quote that needs to be hanged on your bedroom wall or ceiling. It will give you the confidence that you need to go to the gym and work on your fitness goals. This is one of those fitness quotes that’s meant to make you reconsider giving up if you were thinking about it. If you’re one of those people that quits the gym after every one or two months, this quote is for you. Starting over every time can make you feel as if you’re going in circles. Therefore, don’t do it. This quote reminds us that fitness goals vary from one individual to another; therefore, you shouldn’t copy someone else’s goal because you think that’s the limit. Focus on your goal and see how far it takes you. As you perform different sets of your workout exercises, make sure that you finish them. Don’t leave a set midway because it hurts, push yourself to complete it since that’s the ultimate reward. If you want to attain the perfect physique, you have to get on a healthy diet, come up with a feasible workout routine, and make sure that you follow it. There are no shortcuts. You have to be willing to go the extra mile with your exercise routine. If you said that you are going to go for 3 reps of a 15 count bench press, make sure that you do it even if your fingers become sore in the process. In the end, it is better to accomplish something than to be sorry for not achieving it because you gave up too soon. Anytime you think about giving up, remind yourself of this quote. Greatness requires hard work and perseverance. Therefore, do whatever it takes to stick to your workout routine. As you do the final rep on any exercise, remind yourself of this quote. The most important thing about a workout session is completing it. Therefore, don’t allow yourself to quit whenever you feel signs of fatigue. Despite your busy schedule, you have to make time for your workout routine. You can either exercise before you go to sleep or do it very early before you start anything else. This is one of those fitness quotes that remind us of the importance of maintaining your body physique. The hard work comes after you’ve achieved your fitness goals. You have to stick to the same exercise and diet routine if you want your body to remain the same. At the end of the day, people will notice the changes on your body without you telling them that you’ve been working out. Sometimes you need a training partner to motivate one another. The situation gets even better when your training partner is your spouse. You might have been a bit excited when you said that you are going to put in the work to make sure that you lose weight. As a reminder, make sure that you see it through even after the happiness fades away. Always remember that if you want to achieve your destiny of becoming skinny and muscular, you have to do it yourself. Nobody is going to push you or make you do what you don’t want since the decision is entirely up to you. As you go about your daily exercise routine, remember that achieving your fitness goals will take time. Therefore, be patient. Use the above quotes to get motivation for your workout sessions. Remember that nothing great comes easy, and you have to earn what you think you deserve. If you enjoyed this article, tell your friends about it or send them a link to this page. You can also tell us what you thought about the topic by dropping us an email.